These days I often visit a beautiful church in the center of Rome that few people know. 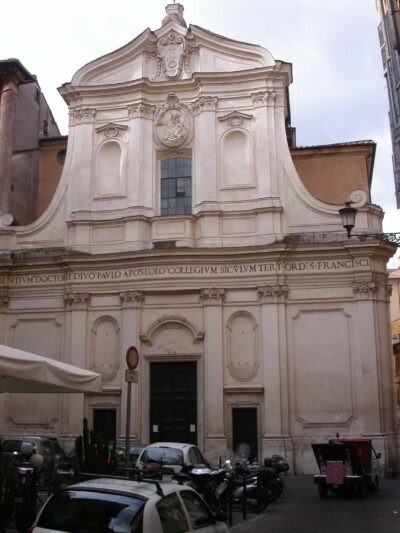 It is the church of San Paolo alla Regola, built on the site which tradition reveres as the one where the Apostle of the Gentiles lived in his two Roman years. In the church there is a small oratory right in the place where Paul’s room would have been. I sit down and think of a passage from the second letter to the Corinthians, which I have always found significant: “Although if I should wish to boast, I would not be foolish, for I would be telling the truth. But I refrain, so that no one may think more of me than what he sees in me or hears from me because of the abundance of the revelations. Therefore, that I might not become too elated, a thorn in the flesh was given to me, an angel of Satan, to beat me, to keep me from being too elated. Three times I begged the Lord about this, that it might leave me, but he said to me, ‘My grace is sufficient for you, for power is made perfect in weakness.’ I will rather boast most gladly of my weaknesses, in order that the power of Christ may dwell with me. Therefore, I am content with weaknesses, insults, hardships, persecutions, and constraints, for the sake of Christ; for when I am weak, then I am strong.” I find it a passage of extraordinary strength and also of profound spirituality, as can be seen at the very end where weakness becomes HIS strength. What is this thorn in the flesh? Of course, many exegetes have provided explanations and they were not wrong, as it seems a particularly significant passage to shed light on the Pauline teaching. The good St Augustine, who saw the thorn in the flesh as a sign of concupiscence, in his discourse 154, gave this exhortation: “Do not be surprised, whoever you are whoever yields to the carnal desires and assents them, you who either find them useful to reach the satiety of the passion, or at least it is so certain that, even if you consider them perverse, you support them however with yielding to them and follow them as far as they lead to make those bad actions that suggest … you are completely carnal. You, and whoever you are, you are completely carnal. If, on the other hand, you have certain perverse desires, which prohibits the law, saying: Do not desire, but observe the other thing that the Law likewise commands: Do not follow your passions; as for the mind you are spiritual, as for the flesh, carnal. One thing is in fact not to desire, another not to follow perverse desires. Not to desire is undoubtedly the perfect man; not to follow one’s own passions is precisely those who fight, those who struggle, those who are deeply committed. Where is the struggle intense, why do we despair to reach a victory? When will the victory be? When death will be absorbed in victory. Then there will be the cry of those who triumph, there will not be the sweat of the fighter. What in the future is that cry of one who triumphs, when this corruptible body is clothed with incorruptibility, and this mortal body will clothe itself with immortality? Look at the winner, listen to those who rejoice, wait for those who triumph. Then the word of Scripture will be fulfilled: Death has been absorbed in victory. Where is your victory, death? Where is or death, your sting? Where is it? Behold, it was, and it is not anymore. Where is your victory, o death? Here is the victory of death: Not what I want to do. Here is the victory of death: We know that the law is spiritual, while I am of flesh. So if the Apostle speaks of himself (“if” I say, I do not confirm), if the Apostle says: We know that the law is spiritual, while I am of flesh; in fact it is spiritual in the mind, carnal in the body. When entirely spiritual? When sowing an animal body, a spiritual body will rise again. In the present, therefore, while the struggle of death ferves, not what I want to do; partly spiritual, partly carnal; spiritual in the best part, carnal in the lower part. I still fight, I have not won yet; it’s great for me not to be won. Not what I want to do, but what I hate, this I do. What are you doing? I have desires. Although I do not allow concupiscence, although it does not follow my desires, I still feel concupiscence; and undoubtedly I am also in this part” (my translation). Augustine, whose carefree youth is not unknown, is still on this side, on the side of those who sometimes do what they do not want, according to another phrase of St Paul. The exegete Ugo Vanni gives a different explanation (found in gliscritti.it): “According to all modern exegetes – and with reasons – it is not a temptation of sexuality, as St Augustine interpreted and how it is sometimes interpreted, especially on the line of the Vulgate, which translated this expression: “a spine that stings the flesh” (“stimulus carnis meae”), which immediately suggests sexuality. In the Greek text there is no idea of stimulation. Obviously the thorns stuck in the flesh make themselves felt, but this is a fact that comes later; it is not the plug itself. If the spine is quietly where it is not a stimulus, it becomes a stimulus, when the thorn is stuck in the flesh, when it makes itself felt … What is this thorniness in the flesh? From all the whole it is clear that these are the difficulties that Paul finds in his apostolate. External difficulties: persecutions, misunderstandings … and internal difficulties, personal. Almost certainly connected with a physical state that prevented the apostolate that God also asked him to do. And so it was probably either a physical illness or a physical weakness. It is that situation of things that are not working in this sense: Paul felt sent by God to bring the Gospel, he was guided by the Spirit even in his apostolic plans, he made apostolic projects and at a certain point the external circumstances and also his personal circumstances – his health – did not allow him to realize them. Things were not working at all! And then he reacts according to his character, praying, praying and praying. He turns to the Lord and tells him: Remove this thorn! That is: smoothen the way! Do you want me to be an apostle? Do you want me to announce the Gospel? Give me the opportunity to announce the Gospel! Do not put these blocks on the road you want me to travel” (my translation). Personally I do not see much evident contrast in this interpretation compared with the one of St Augustine. Both talk about difficulties we have in balancing our desires to do good with our personal inadequacy, whether by illness, inclination to carnality or otherwise. God, who can bring a good out of an evil, uses our infirmity so that we do not become so proud. Those who experience these things can testify that nothing holds us humble as the awareness of our own unworthiness. Benedict XVI, in his audience on June 13, 2012, so commented this passage of Saint Paul: “First of all, what are the weaknesses that the Apostle is talking about? What is this ‘thorn’ in the flesh? We do not know and he does not tell us but his attitude enables us to realize that every difficulty in following Christ and witnessing to his Gospel may be overcome by opening oneself with trust to the Lord’s action. St Paul is well aware that he is an ‘unworthy servant’ (Lk 17:10) — it is not he who has done great things, it is the Lord — [he is] an ‘earthen vessel’ (2 Cor 4:7), in which God places the riches and power of his Grace. In this moment of concentrated contemplative prayer, St Paul understands clearly how to face and how to live every event, especially suffering, difficulty and persecution. The power of God, who does not abandon us or leave us on our own but becomes our support and strength, is revealed at the very moment when we experience our own weakness.” Certainly it is mysterious for us to think of the fact that to our request for help God prefers to make us discover that our weakness becomes our strength, but He first gave us the example in becoming a child for our salvation. Could not the Son of God already appear as man made in the splendor of His power? But this He did not choose. St John Paul II, in one of his audiences (June 11, 1986) could say: “In the eternal plan of God, and in his providential action in the history of man, every evil, and in particular moral evil – sin – is subdued to the good of redemption and salvation through the cross and resurrection of Christ. One can say that in him God draws good from evil. It draws this in a certain sense from the very evil of sin, which was the cause of the suffering of the Immaculate Lamb and of his terrible death on the cross as a victim for the sins of the world. The liturgy of the Church does not even hesitate to speak, in this regard, of ‘felix culpa’ (Exsultet of the Easter Vigil)” (my translation). Let’s go back to what has been said before: God knows how to draw good from evil. But in order to derive this good it requires that we do not love our sin, but that we recognize it for what it is, a sin in fact, so that our repentance and our affliction may allow God’s grace to dig wider and wider spaces in our soul. Let us act in such a way that the thorn in the flesh serve to keep us humble, submissive to the will of God and always ready, despite our weakness, to cooperate for the victory of Christ the King, Lord of time and history. In the wounds of Jesus, there is a place for our own wounds.